Retail Technology start-up Radius8 announced today its partnership with Yext, the digital knowledge management provider. 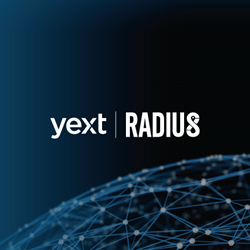 The partnership will make Radius8’s local store platform available to all Yext retail customers on Yext’s recently announced Yext App Directory. Connecting the two software platforms will allow customers of both companies to simply and seamlessly sync store digital knowledge with the Radius8 platform enabling customers to drive more conversion and foot traffic from their Yext Pages. The Radius8 platform provides a locally-inspired online experience for each physical store, by layering in shopper geo-location, store specific inventory, and new intelligent analytics, so that every store has its own unique digital presence that is reflective of the trends and dynamics of that store’s local market. To learn more about the Radius8 and Yext partnership retailers can visit the Yext App Directory and Radius8.com. Radius8 revolutionizes retailers’ ability to digitally merchandise inventory and communicate local trends and events at the individual store level. The R8 Cloud platform is the engine to layer in local context and intelligence to create a unique online presence for each physical store location ultimately driving both online and in-store conversions. Headquartered in Princeton NJ, Radius8 was founded in early 2016 by a team of retail technology experts with the goal of transforming the role of the store in today’s tumultuous retail landscape.